I will share the presentation, video (if possible) with all of you once I come back from Bangalore. Meanwhile pls. note that I will be slow in replying to comments / email. 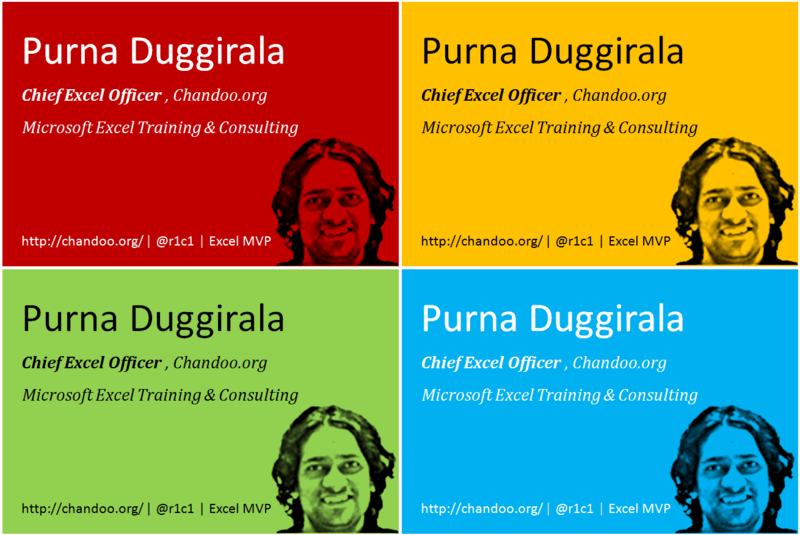 PS: Here is my visiting card which I made for this. Its a Very Nice Card, Chandoo. The subject is not that popular as yet in India hence the attendance figure. We need a few more blogs here discussing the subject. Surely the video presentation will be more audience in your blog! I'm waiting impatiently to see it here. @Pedro... It will be a presentation along with my usual rants. There was no video recording. Well............there's always the time when attendance is not to the mark. I remember my day when I was giving a seminar on Employee Involvement. But....it's more important that the folks who came had a good time and found value. When that's achieved.............mission accomplished. Can you post your presentation? @Ninad... thanks. The presentation along with a detailed post explaining chart selection process will be up next week.